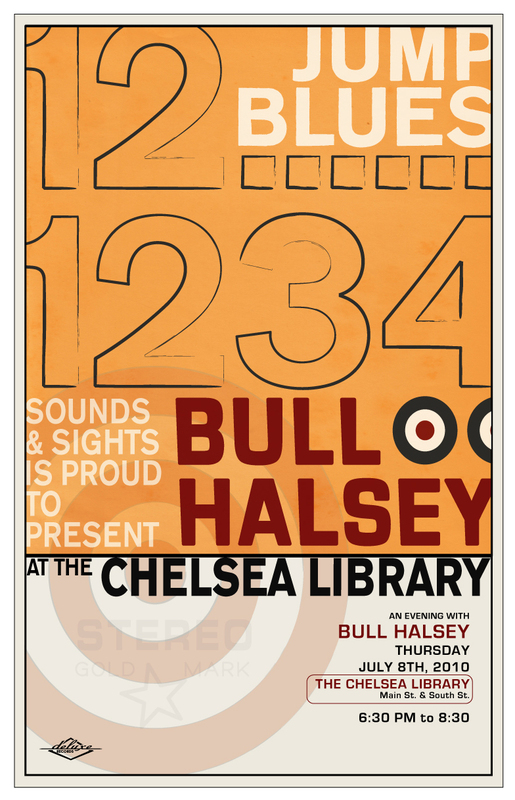 Chelsea’s Sounds and Sights on Thursday Nights – Grab some lawn or maybe a very sought after Chelsea Library lawn chair and lean back. Way back. Bull Halsey is on deck. You’ll feel that cool, cool breeze coming off those hot tube amps. All toe tapping, finger snapping, and head bobbing is greatly encouraged no matter how hot it is. So back on October 17th Bull Halsey performed at the Maumee Theater as part of the IBC (International Blues Competition) qualifier in Toledo hosted by the Black Water Blues Society. Bull Halsey would finish the evening as runner-up to Toledo’s own, Johnny Reed and the House Rockers (very cool stuff). As part of our duties as runner up, we now have the honor to play as part of the ‘Send Off” party for this year’s Black Water Blues Society IBC Competition entrant in the Memphis IBC Finals. The winners Laurie Swyers and Johnny Reed and the House Rockers will compete in Memphis Tennessee on January 20-23, 2010. The ‘Send Off’ party happens at Totters on Sunday, January 10th. During that cool evening in Maumee, Bull Halsey would receive the Black Swamp Blues Society award for ‘Best Self Produced Album’ and was entered into this years IBC competition in Memphis. As of last week, and for the first time in Black Water Blues Society history, the 2010 entry, Hot Dry Work, has advanced to the finals. Hot Dry Work is one of twelve albums from around the country and across the sea that have been given this honor. If you haven’t picked up a copy of Bull Halsey’s latest album you can find it online at CDBaby. Good stuff. I would not lie to you. The Admiral loves toast….plain. No Jelly. Bull Halsey brings it in screaming and shouting at Ypsilanti’s The Corner Brewery. Special guest Danny Pratt puts it over the top with a harp that sings. An evening filled with magic and wonder. No Cover – You heard that right – no cover. That’s zero bucks.